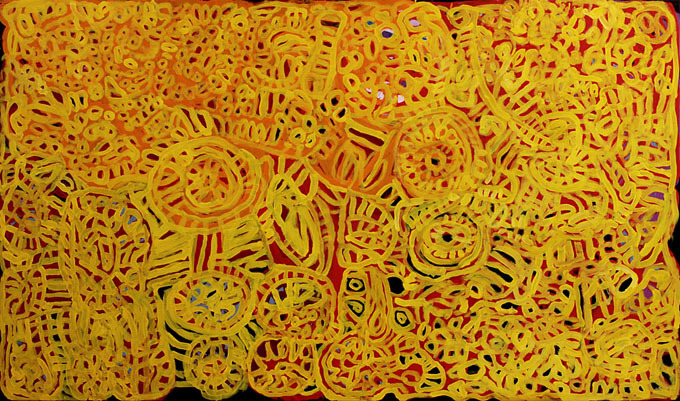 Photo: Painting by Telstra Award winner for 2011, Dickie Minyintiri. All year Alice Springs has had its window onto the Aboriginal art of the moment, that outpouring of cultural affirmation and expressive brilliance coming from ‘The Lands’ – home to the Pitjantjatjara and Yankunytjatjara peoples. Apart from his stockroom shows, the astute Dallas Gold of Raft Artspace has had his eyes fixed firmly on the south-west. The timing for his current show from Ernabella Arts couldn’t have been better. Last week one of its artists and one of the most senior Pitjantjatjara men alive today, Dickie Minyintiri, won the top prize at the country’s oldest Aboriginal art award, the 28th Telstra. It was the second year in a row that an artist from The Lands had taken out the Telstra; in 2010 the prize went to Mr Donegan from Ninuku Arts. There is a fine canvas by Minyintiri hanging in the Raft show, a work in similar vein to the Telstra winner – multi-layered, with strongly inscribed motifs meshing across the surface, allowing glimpses into otherwise hidden depths. What is there is hinted at in the comments about the Telstra work, that the tracks of animals are being traced to important waterholes, where men also conduct their sacred ceremonies. Minyintiri is fairly new to painting on canvas, seemingly another of those astonishing late flowerings that have marked the history of Aboriginal art. As Gold notes, for most artists finding their own visual language is a long and strenuous process; it’s not often that you see “the quantum leaps in visual language and style made in a matter of months” by artists like Minyintiri. Gold puts it down, in part, to the drive and commitment they have to celebrate their culture in this way. There is also a lifetime of training for Aboriginal people who maintain their traditions, from sand-drawing in their earliest years to body-painting for ceremony. While Ernabella Arts is the oldest Aboriginal art centre in Australia, founded as a craft room in 1948, the artists for a long time resisted painting Tjukurrpa, their ‘dreaming’ stories. Under the influence of Christian missionaries, they developed a craft practice, including clothing and household items as well as traditional artifacts, and later batiks and ceramics. Their painting was distinctive for its colourful, decorative stylisations known as walka, reminiscent of Paisley designs and utterly remote from the work on canvas we see coming from the region today. However, there is an echo of the Ernabella craft tradition in this show in the ceramic work made in the course of a recent workshop for the men at the art centre. It includes a couple of pieces by Minyintiri, hand-built cylindrical forms with sgraffito designs, and several by Pepai Jangala Carroll, eye-catching for both their form and the liveliness of design brought about by contrasting textures and tones. The simplicity of aesthetic in his ceramics though stands apart from his finesse as a painter – his dotting like shifting desert sands, seen from a great height, taking the eye inexorably to the heart of his picture where a tiny space opens up, as if onto infinity. Most viewers can’t hope to know the depth of meaning that works of this calibre have for the artists who create them, but their aesthetic strength allows them to reach us on another plane. At the same time the work’s cultural integrity is felt intuitively. That’s the intriguing experience of the power of art. There’s more of it in store with Raft’s twin shows for the Alice Desert Festival. Both are from Tjungu Palya, another art centre on The Lands: one will be a solo tribute show for Jimmy Baker, the other a group show. They open on September 8, the eve of Desert Mob, which will no doubt offer a further occasion for artists from The Lands to shine. SLIDE SHOW: Kapi Tjukula (Waterholes) by Dickie Minyintiri • the artist with his Telstra winning work, Kanyalakutjina (Euro tracks), photo courtesy MAGNT • ceramic workshop at Ernabella, from left Gordon Ingkatji (his piece is not in the Raft show), Andy Tjilari, Dickie Minyintiri in his favoured policeman’s cap • Tali – sand dune, ceramic by Pepai Jangala Carroll • Kapi Tjukula at Ilpili, ceramic by Pepai Jangala Carroll • Kapi Tjukula, ceramic by Dickie Minyintiri • Walungurru by Pepai Jangala Carroll. All photos courtesy Ernabella Arts and Raft Artspace, unless otherwise indicated.